IVF/ART procedures for human and animal reproduction require a controlled work environment. 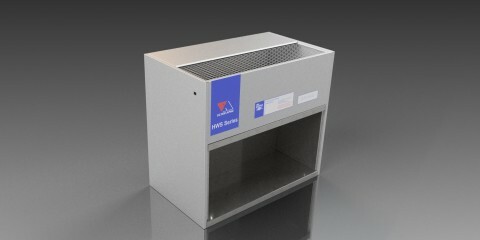 Ultra-clean conditions are required to minimise microbial contamination in the aseptic handling of gametes and embryos. IVF/ART procedures for human and animal reproduction require a controlled work environment. 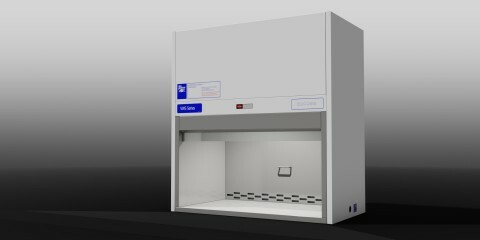 Ultra-clean conditions are required to minimise microbial contamination in the aseptic handling of gametes and embryos. 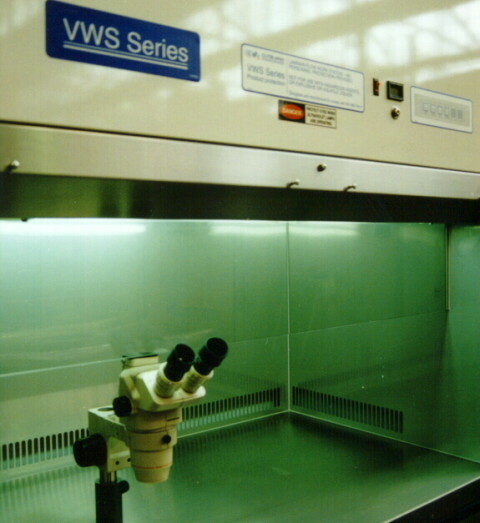 A warmed work surface is necessary to prevent thermal shock and, in most applications, provision for use of a microscope within the work zone is required. 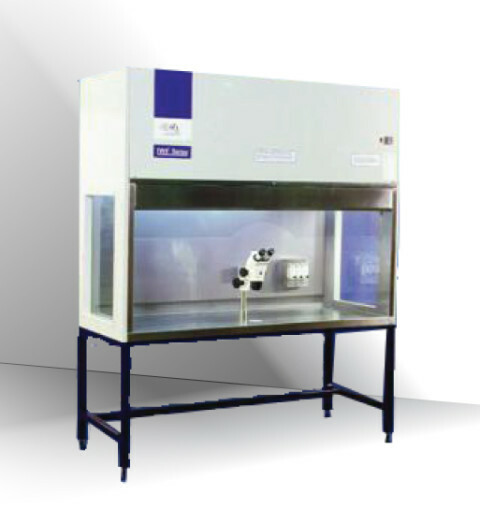 Clyde-Apac’s IVF Series laminar airflow cabinets satisfy these requirements. 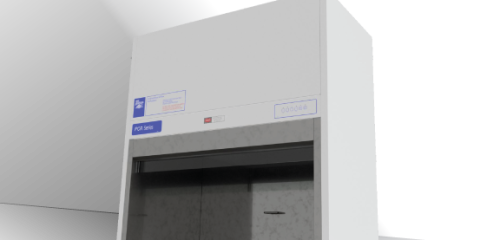 IVF Series cabinets are laminar flow workstations that are available with work zone width of 90cm, 120cm or 180cm. 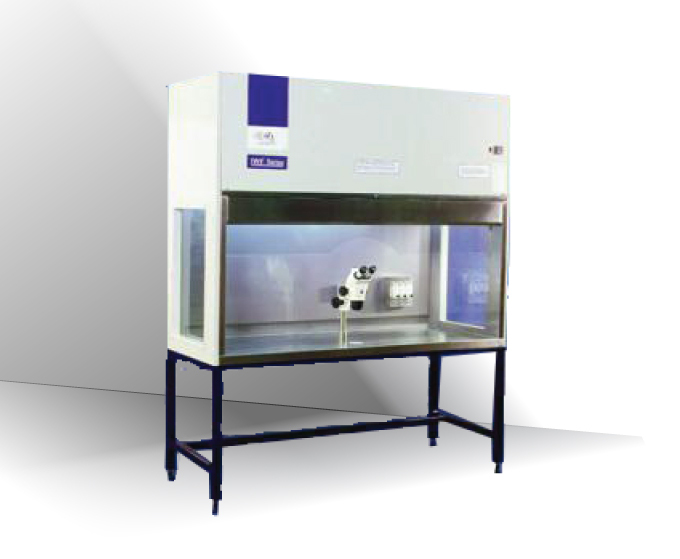 Internal work height of 80 cm allows effective and comfortable use of a wide range of stereo microscopes.The standard configuration supplied is a cabinet with a special floor stand, and this is the preferred arrangement. An optional configuration for installation on a normal laboratory bench is available, but this increases the internal work height to a point that may compromise ergonomics. 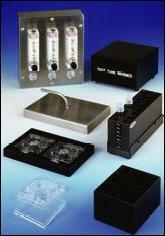 Heated panels under the stainless steel work surface maintain a temperature of 37.5OC with uniformity within 1OC. The entire work surface is heated except for the perimeter, with markings to delineate the heated area. A digital display mounted on the cabinet control panel indicates the temperature, and an audible alarm signifies any over-temperature condition. 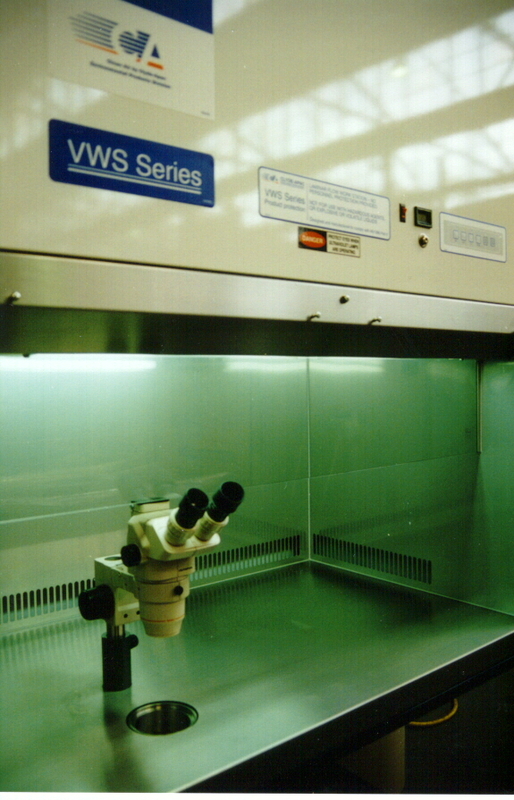 A penetration in the work surface and a window for transmitted light allow fitting of a specific stereo microscope that is provided by the cabinet user. The transmitted light source and transformer are located underneath the work surface*. Typically, the microscope penetration is located in the centre of the work zone with alternative locations on the left or right hand side.The user may provide a separate transparent heated stage over the light source. Air cleanliness in the work zone is Class 3.5 (Class 100) and each cabinet is factory-tested and certified by a NATA-registered laboratory to establish compliance with the performance requirements of AS 1386, Part 5. › In special circumstances, e.g. if faulty operation is suspected.